Leadership commitment and fast-growing enrollment are changing the face of the Stanislaus State Stockton Campus. University and community leaders laid out plans for expanded programs and facility improvements at a Stockton Campus Forum hosted by President Ellen Junn. Stanislaus State is investing in its Stockton location to better serve the needs of San Joaquin County, the most populous area in the University’s six-county service region, Junn told the crowd and online viewers. Enrollment in Stockton programs grew 17 percent last year. About 800 students count the site as their home campus, 8 percent of Stan State’s total enrollment. A new identity: What was called the Stockton Center will now be recognized as the Stanislaus State Stockton Campus, with new signage and social media presence coming soon. Four additional tenure-track faculty positions in residence at the Stockton Campus have been created. New posts have been added in criminal justice and business administration and a search is underway for a finance professor. A communications faculty position is coming soon, said Provost Kimberly Greer. “We are beginning conversations about new programs we might develop that are specific to the Stockton area, looking at regional employer demand,” Greer said. The Stockton Campus has developed partnerships with business and civic leaders, including the city of Stockton, the Reinvent Stockton Foundation and former state Sen. Patrick Johnston. The Public Higher Education Advisory Board for San Joaquin County, which includes leaders from San Joaquin Delta College, draws community stakeholders together. 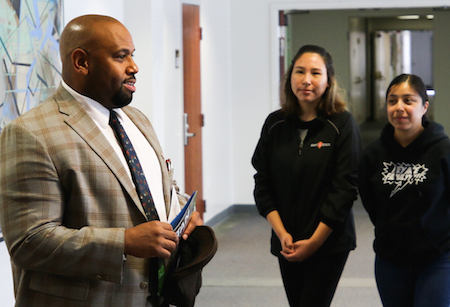 “If there are opportunities for us to prepare students for these jobs of tomorrow, let’s build those relationships and those pipelines now,” said Stockton Campus Dean Faimous Harrison. A five-year Strategic Plan for the Stockton Campus has been developed, proposing a more comprehensive college experience with greater on-site support. The Warriors On the Way (WOW) program with Delta College paves a pathway to four-year bachelor’s degrees for transfer students to the Stockton Campus in psychology, liberal studies and business administration. “It really does raise educational attainment. I think it’s a program that’s a win-win for everybody,” said Gitanjali Kaul, vice president of strategic planning, enrollment management and innovation. To house the growing campus enrollment and offerings at the Stockton Campus, a new classroom building is being designed. Input is being sought from faculty, staff and students on top priorities for the space, which does not yet have a timeline for construction. “I want us to build an exciting, state-of-the-art building that will really be a center of learning,” Junn said. She envisions a structure with the visibility and architectural poise to anchor a campus within the University Park site. Faculty members who spoke at the meeting urged expanding on-site student support services, particularly a writing center, testing room and counseling services, and enhancing the library. They noted the Campus, which primarily serves working parents, also needs a spot to grab a quick meal and space for student groups to meet.